Let’s start at the bottom and work our way up, which, incidentally, puts the injuries in chronological order. The three small gashes from wrist to knuckle are from yanking my cell phone from under the car seat during Iko’s first of two emergency vet visits in one day–extreme bowel inflammation and unrelated allergic reaction. Fortunately, she’s now fully recovered. In almost three decades of being a dog owner/parent, I’d never experienced either situation until that day. And I’d also never previously dropped my phone down that tiny gap between seat and center console before. The string of profanities would make your eyes water. 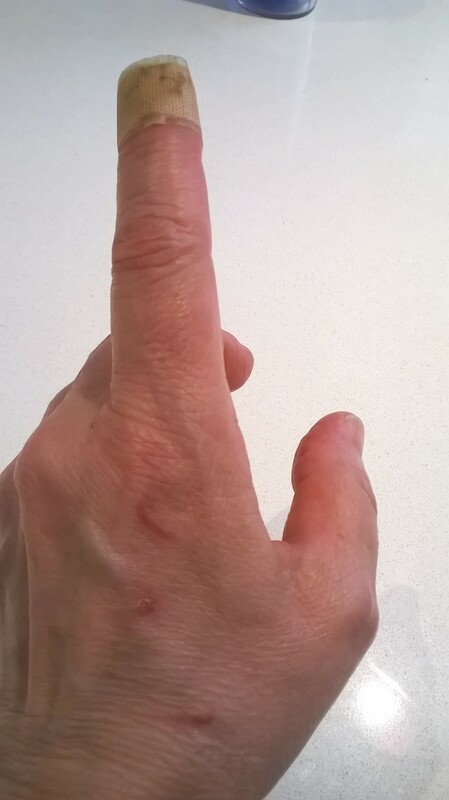 Lost in the skin fold and the shadow are three bites between the index and middle finger. Two mosquito bites, one diagnosed as a spider bite by Dr. Hubs. I agree with this diagnosis as I noticed the bite shortly after mistaking a large spider in the grass for a small toad. Really. It made the grass move as it crawled. And since I was at ground level weeding, I got a good look at it just before I shot up and jumped back. Only a silent scream. Finally, the fingertip. From the top knuckle up, significant swelling and hurt like a son of a. . . for several days. To state the obvious, infected. (May I take a moment here to praise the efficacy of Smile’s PRID Drawing Salve? Here at we-don’t-go-to-the-doctor-unless-disability-or-death-is-a-plausibility, we’ll try anything that doesn’t hint of snake oil.) No visible injury but the stabbing pain originates from a tiny spot in the cuticle; the throbbing is generalized to the bandaged area. Likely a small puncture from landscaping work. The finger has reduced to almost normal size, the color now almost normal, and using a keyboard normally is almost possible. A week of persistent, low-grade cussing and frequent exhibition of the facial expression that causes people to back away. What I did to anger the universe I do not know. As my niece says, I shake my fist at you!! And I would, except I can’t clench a fist yet.